Fernando Gaviria won stage four of the Tour de France as Mark Cavendish suffered further frustration in Sarzeau. Quick-Step's Gaviria edged out Peter Sagan at the line for his second stage victory of this year's Tour, but Cavendish was left shaking a fist in anger after being caught out of position and touched by Dylan Groenewegen in the battle for space. BMC's Greg Van Avermaet retained the yellow jersey by finishing in the front group at the end of the 195km stage from La Baule. Cavendish, looking to add to his 30 career Tour stage wins and chase down Eddy Merckx's all-time record of 34, had been unable to contest sprints on the opening two stages after getting caught up in the chaos of their technical finishes. Here his team looked well placed on the left-hand side of the road after the peloton's late catch of the day's breakaway almost in sight of the finish line. But there was another breakdown in the Dimension Data lead-out train at a crucial moment as they perhaps hit the front too soon, and Cavendish could not respond as his rivals swarmed past. By the time LottoNL-Jumbo's Groenewegen brushed by him, Cavendish already looked out of it. That left Gaviria, the 23-year-old Colombian making his Tour debut this year, to put in another huge turn of power which proved too much for Sagan despite a late push. Chris Froome and the rest of the general classification contenders finished in the main group to ensure status quo in the battle for yellow, with EF Education First-Drapac's Rigoberto Uran successfully chasing back on after being caught in a late crash to stay 10th, 35 seconds off Van Avermaet. Meanwhile, International cycling boss David Lappartient accused Team Sky principal Dave Brailsford of insulting French people for saying he had a "French mayor mentality". 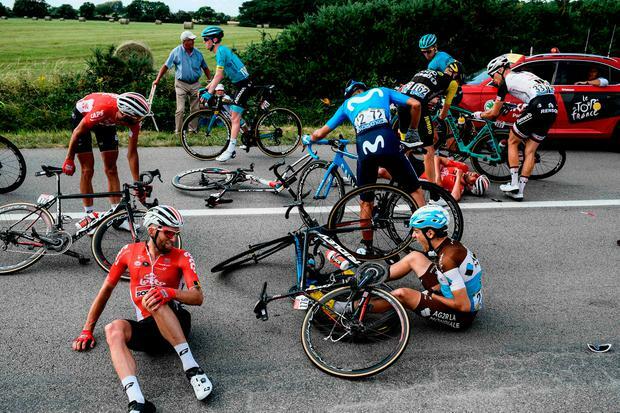 The Frenchman - himself a town mayor - was elected International Cycling Union (UCI) president last September and had to deal with Sky rider Chris Froome's positive test for excessive levels of an asthma drug in last year's Vuelta a Espana. The Briton was cleared just before the start of this year's Tour de France, but he has been jeered and booed since the race started on Saturday. Lappartient said the affair had damaged the image of cycling and that he would have preferred Froome to withdraw from racing while the case was being investigated. "I gave him the benefit of the doubt when he started," Brailsford said of Lappartient on Sunday. "I thought, 'OK, he is new to the job, he obviously doesn't quite understand the responsibilities of a presidential role.' I think he has still got the local French mayor kind of mentality." The remark struck a chord as Lappartient has been the mayor of the Brittany town of Sarzeau, where the fourth stage of the Tour ended yesterday , for 10 years. "When you have his (Brailsford's) level of popularity, you'd do better to keep a low profile," Lappartient said. "Who hosts the Tour de France stages? The French mayors. So it's an insult to all the 35,000 French mayors and to French people in general."